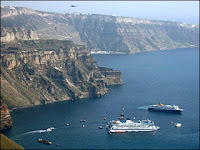 With Easter, the unofficial start of pre-tourist season in Greece not even upon us, AP reported this afternoon that a cruise ship run by Cypriot Louis Cruise Lines, SEA DIAMOND, hit rocks off the coast of Santorini, took on water and required an impressive rescue consisting of 12 ships, along with six navy rescue helicopters, two military transport plans and four warships. The rescue of the nearly 1,200 tourists and 400-member crew was extensive, comparable to the equivalent of evacuating a 12-story building floating at sea, and resulted in the safe return of passengers and crew either to Athens or back to Santorini. - The rescue process and result went off without a hitch based on accounts from officials and rescuees alike. - Naysayers questioning Greek organizational capability should and will likely be silenced (at least for a bit). - Skeptical and pessimistic Greeks concerned about media can find solace in balanced and glowing coverage of a potentially disastrous scenario. While I have no doubt that this was taxing for all involved, I am thrilled that this was handled and presented famously - kudos to Greek efforts and those that reported it objectively (unlike me). For more information, click here for the AP story. nice blog. Now I have a new source for all things Greek!